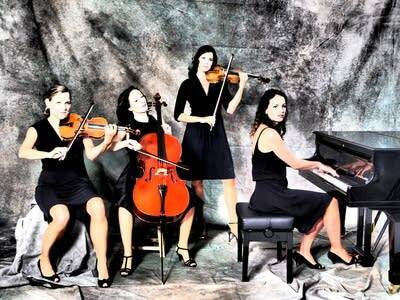 Are these women the Harlem Globetrotters of piano quartets? How dare these women take such liberties with Vivaldi and other greats?! I'm shocked … SHOCKED I tell you! In honesty, I'm quite impressed. The women of Salut Salon quartet  Angelika Bachmann (violin), Iris Siegfried (violin and vocals), Anne-Monika von Twardowski (piano) and Sonja Lena Schmid (cello)  combine virtuosity, acrobatics and a sense of fun in their performances. The result is surprising, enchanting and overall, entertaining. According to their official bio, the Salut Salon musicians "share the same humor. They love to laugh, they laugh a lot, especially at the things that go terribly wrong, even in front of an audience."